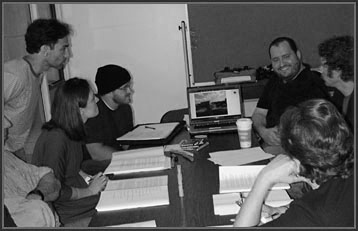 One of the first stages of development is to provide the play with a reading, with a director, stage manager and actors. These will be conducted several ways. Private readings with actors, for the playwright, followed by a discussion of the dramaturgical elements of the work. Public Readings for an invited audience with discussion to follow, and a follow-up session alone with the writer, director and dramaturge. 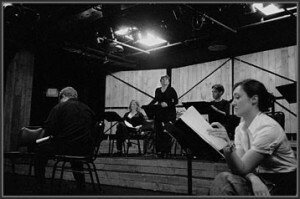 Staged Readings for the public, in which the company of actors work with the writer and director for a week or more to put the play on its feet. This would also be followed by a discussion, and a follow-up session. The type of reading a play receives will depend on what is most useful for the playwright. Plays in their final stages of development will be given a workshop with an artistic team consisting of director, stage manager, dramaturge, actors, and possibly designers to look at the play in depth as a production. The goals of these workshops are to examine the play for its dramatic cohesiveness, and to consider the possibility of a full production. These workshops will not be for the public, although a small private audience might be included for the final reading. In some cases, after a play has received a workshop, the workshop production will be presented for the public. These workshop productions will be minimally produced with 1-3 performances, and are primarily to assist the creative team in determining the viability of the script. The main goal of our play development is to eventually bring highly crafted plays to the stage. Only when the Company determines that a play is ready for production, will it begin the process of scheduling a full production at a Houston venue. A monthly discussion series for playwrights, dramaturgs, and all varieties of theater-goers that focuses on playcraft, structure, and the fine art of being an extra-sensory audience member.